Deeply rooted in the classics of Oriental medicine, the ancient Korean art of Sasang medicine explains how we each are born with a specific body “type” that establishes our physical and emotional strengths and weaknesses. These traits have a direct influence on how we interact with others and react to stress, trauma, and illness. Discovering your type can empower you to make the best choices regarding your health and well-being. 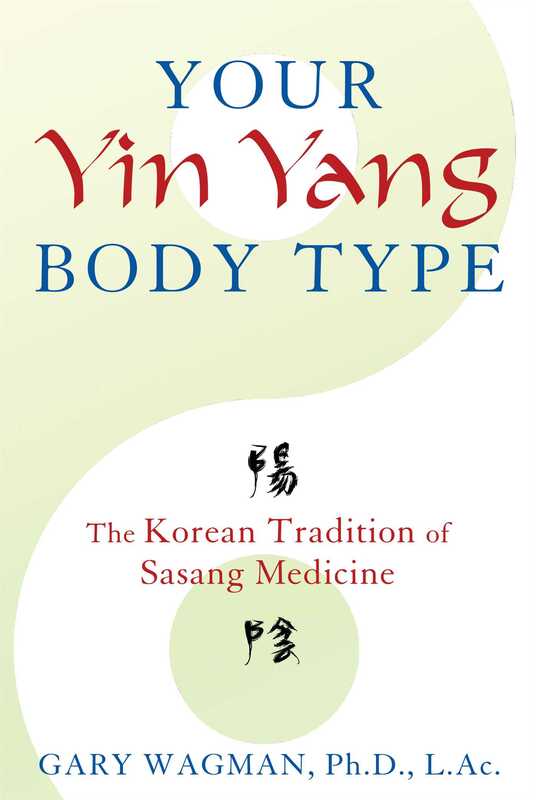 In this book, Dr. Gary Wagman explores the 4 major body types of Sasang medicine and 2 different self-tests to determine your type. He explains the balance of Yin and Yang energy within the organs for each type and how this underlies your emotional tendencies and health patterns. With a strong spleen and weaker kidneys, for example, the Yang type A person will be inclined to anger and susceptible to urinary complaints. Offering stories from his Sasang medical practice, as well as his own healing, the author shows how organ excesses and deficiencies are often the culprit in emotional and psychological issues and how addressing these energetic imbalances can bring about lasting change. Dr. Wagman provides an extensive look at the most beneficial foods for each type and those that could be harmful, as well as which forms of exercise are most effective. He shows which herbs are most compatible for you and which could exacerbate your inborn energetic imbalances. He offers Sasang approaches for a range of common conditions, from high blood pressure, aching joints, and allergies to common colds, inadequate sleep, and weight gain. He also introduces ways to enhance spiritual well-being by balancing your innate emotional strengths and weaknesses. Addressing the body, mind, and spirit, discovering your Yin Yang body type provides the key to optimizing physical, emotional, and spiritual health. Have you ever wondered why someone you’ve known could drink beer like water without getting a hangover? Or why someone could blithely chain-smoke into their nineties? Simply thinking these people are just healthier than you and I would not suffice. Excessive alcohol drinking eventually leads to cirrhosis of the liver, while chain-smoking is a sure path to emphysema. To avoid these conditions while excessively smoking or drinking throughout one’s life may seem almost superhuman! According to Sasang Medicine, each and every person is born with a strongest and weakest organ depending on their body type. The health of someone who is born with weaker lungs will usually be compromised even after the first cigarette. The person born with a weaker liver often becomes ill even after his or her first experience with alcohol. Yet smoking and drinking may have no effect on the health of those whose strongest organs are the lungs or liver. The Sasang medical system is based on the theory that each individual is born with varying emotional and physical strengths and weaknesses depending on his or her body type. These tendencies have a direct influence on how our minds and bodies react to stress and illness. The Korean word sasang means “four types.” It signifies the classification of all people into four major body types--Yin A, Yin B, Yang A, and Yang B. This medical system was first established by the Korean doctor Lee Jae Ma (1837-1900), who was well versed in the Oriental medical tradition, a system that focuses on the balance of Yin and Yang energy to treat emotional and physical illnesses. Dr. Ma was distraught by the fact that some patients who suffered from the same symptoms improved quickly, while others suffered longer despite adequate treatment. The development of Sasang Medicine was based on Dr. Ma’s ability to focus treatment on the individual rather than the disease, emphasizing the unique constitutional structure of each patient. Tip #1: Focus on overall tendencies--certain tendencies may change from day to day or throughout the years. It is sometimes helpful to reflect on how things used to be as a child since our body type never changes. Tip #2: Some questions may require examining your physical body closely. You may have to take a good look in the mirror or observe how you walk to answer certain questions. Tip #3: Do not answer a question if, no matter how much you try, an answer does not come to mind. It is better to leave it blank than to obscure test results. Tip #4: If you are not sure how to answer a particular question, refer to the answer key provided after the test. It offers an in depth explanation of each question, making it easier to answer. Tip #5: If you are still unsure how to answer a particular question or what body type you are, continue onward to the Body Shape section. Your body shape may be adequate in determining your type. Tip #6: Did you score a tie between two body types? Is the difference between two types slight? If so, try the test again, maybe with the help of someone who knows you well. If the difference between two body types remains slight, go with the highest score. Gary Wagman, Ph.D., L.Ac., is an acupuncturist and doctor of Oriental Medicine. He was the first foreign student at the Daejeon University of Oriental Medicine in South Korea and lived in Asia for more than 8 years. The founder of Harmony Clinic and the American Institute of Korean Medicine, he lives in Portland, Oregon.